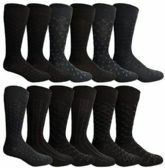 6 Pairs of Yacht&Smith Dress Socks, Colorful Patterned Assorted Styles (Pack E) at low wholesale prices. Socksinbulk.com offers Mens Dress Sock at bulk discounted prices. MENS DRESS SOCKS: Choose from 5 styles of stylish and fashionable dress socks for men. 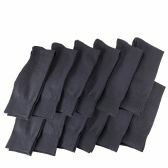 Each pack includes 6 pairs of high quality cotton blend socks. Each pair features a premium softness and moisture wicking capabilities for comfortably daily wear. 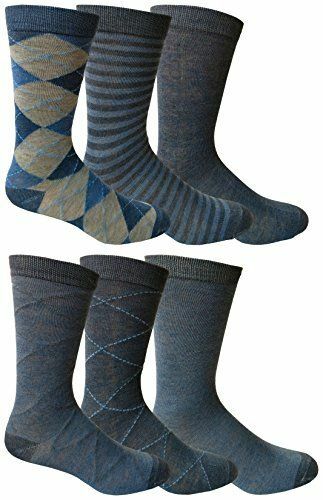 DESIGNER DRESS SOCKS: Whether you’re wearing it formally or casually, these socks can match with almost any outfit with a wide range of colors. Pair it with your favorite pair of dress socks and trousers and make the highlight. The comfort fit with a control top ensures that your dress socks stay snug on your feet and calves. QUALITY FIBERS: Made with 95% polyester, and 5% spandex. Sock size 10-13 will fit men shoe sizes 7-11 (US). Machine wash cold with like colors. Non-chlorine bleach only when needed. Tumble dry low. Do not iron. Choose from 5 stylish patterned designs for men’s dress socks. Dress to impress with these fashionable socks including striped, dotted, argyles, and more. Whether you’re looking to pair these socks with a formal outfit or just to wear casually, these socks are classy and stylish. Made with 95% polyester, and 5% spandex. Machine wash cold with like colors. Non chlorine bleach only when needed. Tumble dry low. Do not iron.